I went to the movies this past weekend, something that I have not done very often. I went to see Argo the movie which tells the story of the 6 American embassy employees who took refuge in the Canadian Ambassador's residence during the Iranian hostage crisis in the late 70's. Central to the final sections of the movie is the capture of images of one of the fugitive employees through reassembling the strip cut shreds of documents from the embassy since the documents had not been put through a cross cut shredder prior to the militants capturing the embassy. 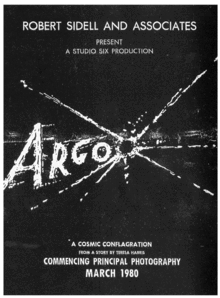 As the movie goes, a CIA operative is sent to Iran to help extract the American's using a fictitious Sci Fi Movie called Argo (thus the title) and this became the code name for the operation. I don't know if it is true as shown in the movie, but the story of the rescue is now being told because the information on the operation has been declassified by the US government. Whether the Argo story and the capture of many government documents in Iran was the reason, most levels of governments in the US and Canada, and I would assume around the world, define specific levels of shredding that must be used to destroy paper records. These security levels range from a low of 1 to a high security shred of 6. Most of these shred levels are achieved using cross cut shredders which produce a paper chaff of a specified size or smaller. There are some shredders using different designs which can meet these levels such as the Kobra Cyclone but cross cut is the most common method. The high security shred size used for top secret documents is very small. It can be blown around with a simple puff of air it is so miniscule. For commercial operations and in non top secret situations there are cross cut shredders which still produce a small chaff but not one as miniscule as level 6. 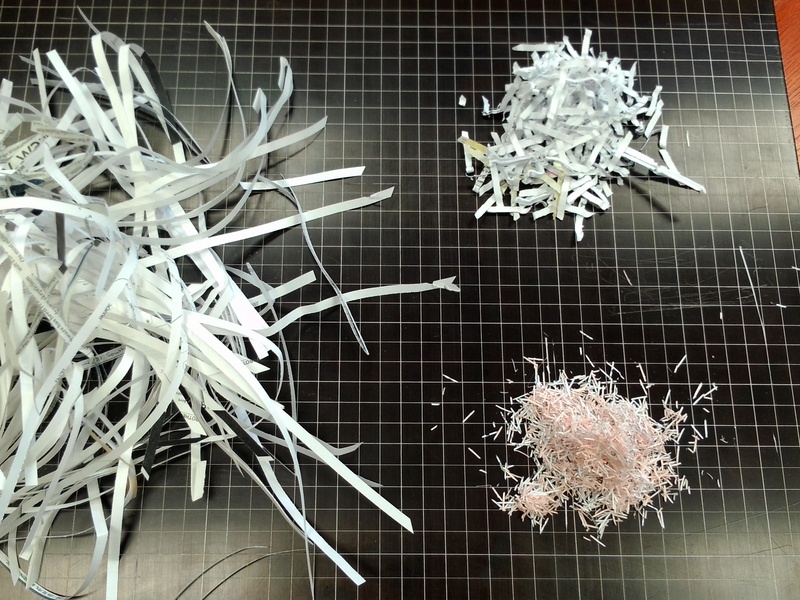 The image below shows a comparison of strip cut shredder output, a commercial cross cut shredder output and a High Security cross cut shredder output. You can see from the picture that the strip cut shreds are quite large and uniform, the commercial cross cut (top right) are smaller and more jumbled and the high security (bottom right) are tiny. On the high shred it is virtually impossible to make out any details of the material that has been shredded. The implications of these relative outputs are important for all businesses today and especially for those that are handling confidential data. Of course every business has some data that should be held in confidence even if it is only their HR information which must be controlled due to government privacy legislation such as the PIPEDA act in Ontario. How carefully you must destroy this information is for you to judge but the minimum level would be to shred anything that might embarrass, disclose pricing information, proprietary client or supplier information, or employee records. Is it feasible to recreate a document? We tried a simple experiment in our office by strip shredding a single page document that included a couple of small pictures and mostly text. In a blind test several of our employees were asked to assemble the document from the strips. The fastest did so in four minutes and everyone who tried was successful in putting the document back together. While admittedly this was not a perfect test, since the document was singular in nature and the strips were not mingled with other documents, the concept as shown in Argo where a person's image was rebuilt from documents put through a strip cut shredder, certainly was proven to be possible. So what does this mean for your office? Since businesses are responsible for the privacy and security of the information they control through paper documents (electronic as well but that is a topic for another day) understanding the implications of your chosen method of destruction is critical. Using a strip cut shredder or shredding service doing strip cut may be okay for documents with little commercial or privacy value. Strip cut is faster and less costly but also less secure. Using a commercial grade cross cut shredder is okay for non mission critical information and for lower security level shredding. These units and services can still be quite fast and relatively affordable. Using a high security grade cross cut shredder is mandatory for anything that is defined as top secret or which could be highly detrimental to either the business or individuals. This level of processing is slower, more complex to employ and more costly to obtain but pays off in the protection it provides. Some government organizations and departments will specify this level of destruction as a provision of contracts or legislation. As more and more emphasis is placed on privacy and control of intellectual property in businesses, understanding the way your organization handles its paper waste is an important consideration. This is often not given much weight as shredding tools are usually considered and driven by trying to find the lowest price and least inconvenient solution. Unfortunately, it is hard to compare the apparently hypothetical security impact with the hard numbers when the purchasing decision is made. Unless some analysis has been undertaken prior to going out to buy the solution, the risk of disclosure and unsecure destruction will increase. In the end a few dollars more might offer a substantially better solution with a monumentally reduced risk. Shredders tend to last a long time so the acquisition cost can be spread over several years which makes it easier to go for the higher quality device. Of course if you are just throwing your paper records into the trash, anything would be an improvement. How do you destroy your confidential paper? Do you define what is required to be shred? Is this process something that is audited regulary or is it left to chance? Could you get dumpster dived to your detriment? This blog discusses ways to optimize and improve the management and production of documents used in your business. Business documents and their content - whether paper or electronic, are the repository of corporate knowledge which underpins all of the functions of commerce. Using them well can have a significant impact on your success.